Quote from a dear friend and veteran air gunner.158 Sqn. 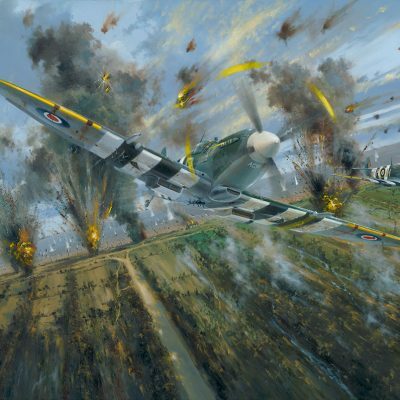 This painting depicts a scene that would be very familiar to many veteran Bomber Command aircrews. The sight of a shot up and crippled bomber limping home, two of her props feathered. With her battle-damage critical and wounded or dead crew aboard, her skipper is battling with her controls to keep her flying as she nears perilously close to an unforgiving and bitterly cold North sea. 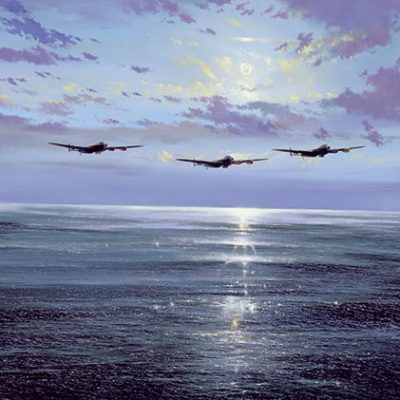 In this case of this painting, this is a Lancaster. The squadron codes are unseen at this angle but that’s not the important detail of this work. 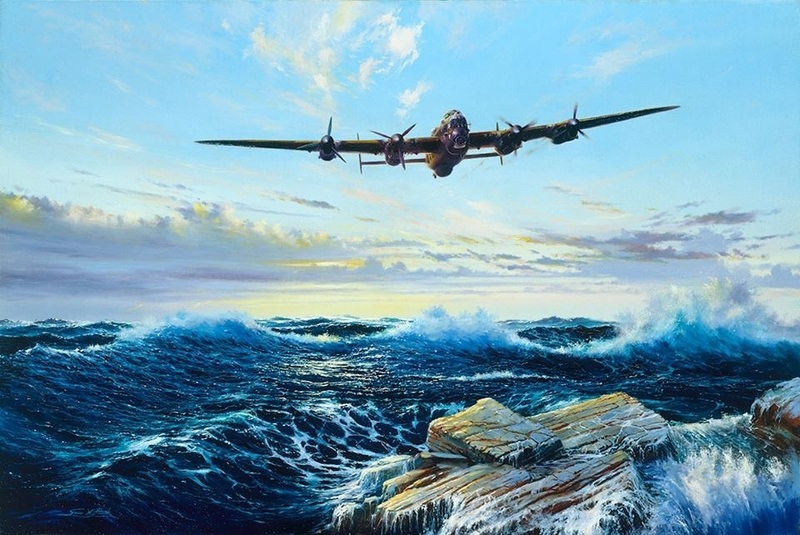 She represents the many, many instances of scenes like this for all Halifax and Stirling squadron crews, as well of course, as Lancaster crews who came home in these nerve-wracking conditions following their night assaults on Hitler’s industrial cities. The rocks and breaking surf suggest this crew are going to be lucky and win the battle for the homeward flight to reach the English coast. Many others were just as fortunate. 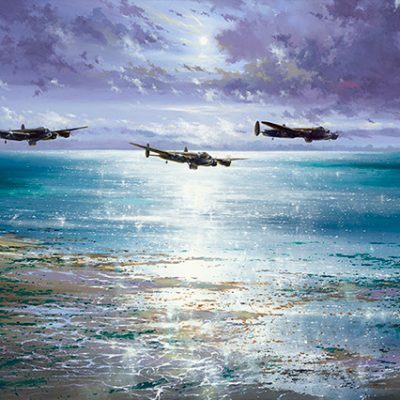 Their Halifax, their Stirling, Hampden, Wellington or Whitley held together and kept flying all the way home. Many again were not so lucky. Ditching into the sea in darkness and bitter winds and relentless waves to struggle into a dinghy, take care of a wounded comrade and figure out where this last position is known to be. Release the two carrier pigeons that early-war RAF aircraft had aboard and pray for early salvation from an RAF Rescue launch or fishing boat. But for this crew at least, the sea shall not have them either. But a safe return to their Lincolnshire airfield. Undefeated.